Thank you for purchasing a RICOH IMAGING product and for taking this opportunity to register it with us. Registering your product takes only a minute and provides RICOH IMAGING valuable insight when developing future products and features. To get started, simply select your product from the list below, and you’ll be taken to our easy-to-use registration form. IMPORTANT NOTE FOR OUR INTERNATIONAL CUSTOMERS: RICOH IMAGING has subsidiaries/distributors in many countries. Each subsidiary is prohibited from operating outside its specific trade area. If you live in a country not included in the box below, this website may not support you. Please click here to find a RICOH IMAGING representative in your geographical region. Ricoh Imaging North America product registration is only for residents of the United States of America, Puerto Rico, and Canada. For outside of the North America region, please click here to visit our global website. I'd like to hear more from RICOH IMAGING. Please Sign me up for emails about new products, special offers and educational materials. RICOH IMAGING Imaging Company does not sell, trade or rent your personal information, including e-mail addresses, to third parties. RICOH IMAGING Imaging Company no vende, comercializa ni alquila su información personal, lo cual incluye las direcciones de correo electrónico, a otras empresas. Haga clic aquí para leer nuestra política de la privacidad. Please note: Warranty only valid for products purchased from Authorized Ricoh/Pentax dealers. Click here for a listing of authorized and un-authorized dealers. Dealer Name Choose Dealer Name Amazon (Purchase from Amazon Direct) 17th Street Photo Ace Photo Adolph Gasser, Inc. Adorama Advanced Photo Alaska Camera Allen's Camera Andreotti Firearms Sales Arlington Camera Art Sutch Art's Cameras Plus B&H Barnwood Arms Co. Bear Basin Outfitters Bear Images Photographic Berger Bros Best Buy (Theta Product Only) Best Camera Birdwatching.com Bob's Photo Bridge Sportsmen's Center, Inc C&H Cambridge World Camera Casino Camera Center Camera Company Camera Corner Connecting Point Camera Corral Camera Cottage Camera Craft Camera Doctor Camera Exchange Camera Land Camera Shop Camera West Cameta Camera Canyon Sports Castello's Sporting Goods Central Camera Creve Couer Crown Camera, Inc. CWR Electronics Darkroom of Montana Data Vision Computer DD Camera Corral Digital Photo & Video Center Digital Photohaus Discount Camera Dodd Camera Dom's Surplus Inc. Don's Camera Douglas Business Center Electronics Expo EliteOneMedia F-11 Photographic Supplies Focus Camera Foto Care Four Season Outfitters F-Stop Film & Camera Glazers Camera Supply Gordon's Photo Service Grant Boy's Inc Green's Camera World Hammacher Schlemmer Holiday Camera Hooper Camera & Imaging Horn Photo Huppin's/One Call Idaho Camera, Inc. Image One Imbert & Smithers Inkley's InMotion (Theta Product Only) John Muir Laws K&M Kenmore Camera Land Sea Sky LensRental Looking Glass Photo Los Gatos Birdwatcher MicroCenter (Theta S Product Only) Midwest Camera Exchange Mike Crivello's Camera Mogil's on the Mountain Montana Bird & Garden Nebraska Furniture Mart Neptune Photo OC Camera OC Tanner Oceanside Telescopes Omega Photo Optics 4 Birding Optics Planet Orion Out of This World Perfect Light Camera & Supply Photo Imaging Center Picky Picky Picky Surplus PictureLine PJ's Camera Popflash Photo Precision Camera Pro Photo Pro Photo Supply Pro Sport Center Ricoh Imaging Website Roberts Camera Robi's Camera Center Rockbrook Camera Samy's Camera San Jose Camera & Video Shutterbug Camera Shop SHUTTERBUG, INC. Sierra Arms Corp Smalley's Wholesale Sporting Goods Southern Shooters Supply Tempe Camera The Camera Box The Camera Corner Travelsmith Outfitters Triple S Camera Tri-State Camera UFA Wholesale Sports University Camera Valley Gun, Inc Valley Rod & Gun West Photo Wild Bird Center of Monterey Wilson Camera Worldwide Distrib. Age of the primary user? Please include me in future emails for Ricoh Imaging news and events. 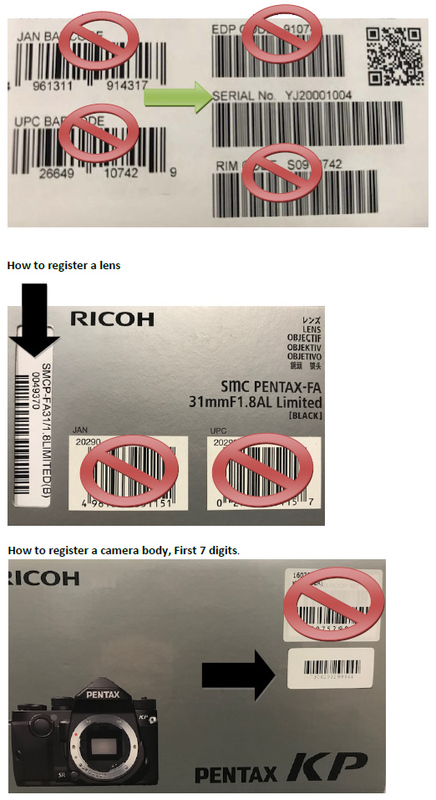 You have successfully registered your Ricoh Imaging product.